Orange has joined the mobile WiFi party by introducing the Novatel Wireless 3352 device with a range of mobile broadband contracts. The Novatel Wireless 3352 offered by Orange is a palm sized device (9 cm long) that effectively works in the same way as a standard home broadband router, but it is completely wireless and creates a wireless hotspot that can connect up to 5 devices that support the 802.11b/g wireless protocols. This means you can connect your laptops, phones, games consoles, iPod and iPad. 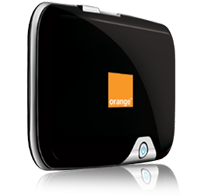 One of the great benefits of the Orange WiFi offering is the flexibility that it offers. If you were to use a standard wireless dongle you would be able to connect only one device at any one given time and this would be through a USB connection. By using a the Orange mobile WiFi device you can connect a range of wireless devices on the move with no need for complicated setup or even any wires to connect. This makes it an ideal option for sharing a connection in the office or in student accommodation or even if you are out and about with friends. The Orange WiFi device incorporates a microSD card slot so that you can use the device to store important files and there is also a micro USB port. Although you can connect your wireless device to the WiFi device entirely wirelessly, the addition of a USB port is important because you can use this for connection purposes for a laptop which would also serve to charge the WiFi device from the power supply from the laptop. 2. Make a note of the SSID (network name) and WiFi key. These can both be found inside the battery cove. 4. Insert the battery, ensuring that the contact points are lined up correctly. 6. Charge the battery for 4 hours before use. 1. Press the power button on the WiFi unit to switch it on. The connection LED and WiFi LED will then light up. 2. Similarly to connecting a wireless device to your home broadband router, you need to switch on your wireless device and search for networks. 3. Once you find the Orange WiFi device in the list of available networks, click “connect”. 4. Input the WiFi key for your Orange WiFi service and you will be connected. 5. Repeat the process for every wireless device you want to sync with the WiFi unit. – You are able to connect up to 5 different wireless devices at the same time so that they all have wireless Internet access. – The unit can be used at home or on the move because it is so portable at a mere 9 cm long and 81 grams. – There is no need for any wires whatsoever. – The unit has a 5 hour battery life or you can connect a laptop to it via USB and the unit will draw power from the laptop. – Available from just £49 on a 12 month mobile broadband contract. The Orange WiFi offering is a welcome addition to the mobile WiFi market and Orange has supported the entry by releasing a range of mobile broadband tariffs that can be used in conjunction with the device. For flexibility, portability and ease of use it is an excellent option for users seeking to connect a range of wireless devices to the Internet with a minimum of fuss. Compare the Orange mobile WiFi tariffs available for this product in our handy comparison table.